On Wednesday, February 10, 1988 (Shevat 22, 1988) the Rebbe’s wife of 59 years, Rebbetzin Chaya Mushka Schneerson, passed away after a brief illness. She had felt ill the night before and was brought to the hospital, where she requested a glass of water. After reciting the blessing “Blessed are You, G‑d… by whose word all things come into being”, she returned her soul to her Maker. 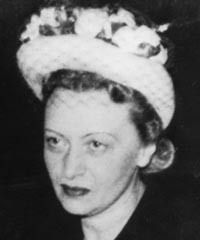 An erudite and wise woman, Rebbetzin Chaya Mushka carried the mantle of her exalted position in a most humble and unpretentious fashion. Though she was the wife of a leader revered by hundreds of thousands, almost nothing was known about her until after her passing, when those who knew her felt that they could tell of her life and personality without violating her jealously guarded privacy. 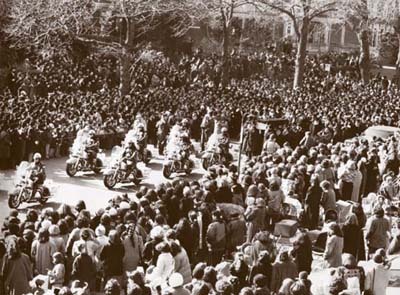 In a farewell fit for a queen, a procession fifteen thousand strong led by an official police motorcade accompanied her to the Chabad cemetery in Queens, New York. There she was interred near her father, the previous Rebbe, Rabbi Yosef Yitzchak Schneerson. On the very day of her burial, the Rebbe established a charity fund in her name, which continues to this day to serve a variety women’s social and educational purposes. In the days and months following her passing, the Rebbe spoke frequently on the theme, “And the living shall take to heart”—how the passing of a person close to oneself should prompt one to positive action, in the form of lessons derived from that person’s life and deeds undertaken to perpetuate his or her memory. Childhood, marriage, work, religion, illness—things that one thinks one knows exactly what they mean—were given new meaning in the Rebbe’s teachings. He did the same with the concepts of death and mourning. The Rebbe noted that Torah law prescribes set periods for mourning the passing of a close relative. A certain set of mourning practices are mandated for the first day; other laws apply to the first three days, seven days, month and year. But isn’t “mourning” a feeling rather than an act? How, then, asked the Rebbe, can a person be instructed to mourn? Or to reduce the intensity of his mourning when a certain mandated "mourning period" ends? Death, explained the Rebbe, is a phenomenon so devastating to our sense of self that we cannot deal with it with any of the ordinary tools of life. Only our submission to the supra-rational law of G‑d can empower us to contain our mourning and not allow it to overwhelm our lives. As for the concept of death itself, the Rebbe saw death not as the end of life, but as the beginning of new, loftier and a greater form of life. For the soul lives on. Indeed, when the soul is freed from the limits of the physical condition, it can express its spirituality and purity unobscured by the body. Also: if we define life not merely as existence but as progression and achievement, a person can live beyond the point that the soul and body are parted. If those in the land of the living are spurred by his passing to do positive, constructive and G‑dly deeds, than the death itself becomes a form of life. Finally, a basic tenet of the Jewish faith is the belief that, in the age of Moshiach, those who have died will be restored to eternal life. Thus death is but a temporary hiatus before a renewed, and far greater, phase of life. Indeed, the Talmud compares death to sleep, implying that, like sleep, it is a "descent for the sake of ascent" — a time of foment and preparation for a greater, more energized tomorrow. "When a close relative passes away, according to G‑d’s will, those that remain here cannot see him anymore with their eyes or hear him with their ears. However, the soul in the World of Truth does see and hear, and when it sees that its relatives are grieving more than the required amount because of its physical absence, it is pained. On the other hand, when it sees that after the mourning period prescribed by the Torah, life went back to its regular cycle and is full of positive actions, it can rest happily." THE REBBE'S REBBETZIN In all facets of life, the Rebbe showed by example. The Rebbe showed us that we should not waste sorrow but turn it to positive energy such as giving tzedaka, or utilizing any of the mitvos available.